Playa Lechi 12 - Oceanfront Vacation Condo with Amazing Sea Views, including a swimming pool! Please contact us for the up to date availability of this beautiful apartement! Enjoy life as it should be in Playa Lechi Residence#12, a luxurious 3rd floor oceanfront apartment. It features 2 bedrooms, each with its own bath, quality appliances, and comfortable furnishings. 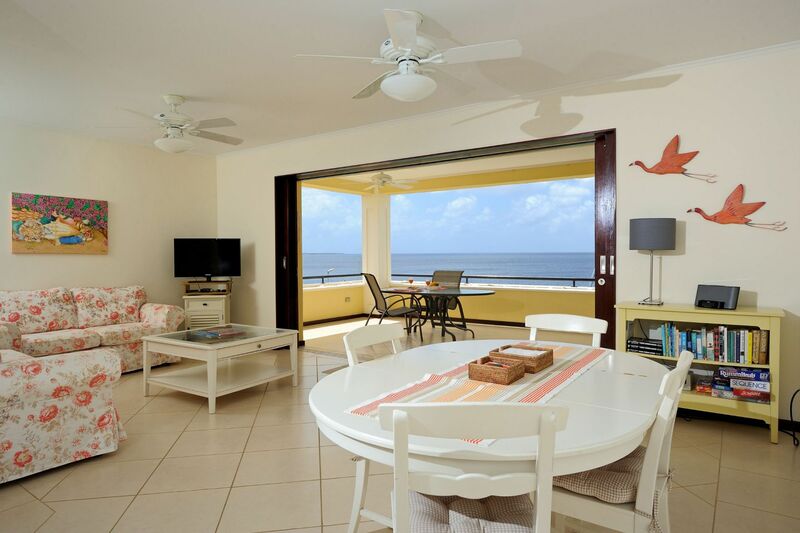 Pocket doors slide open to your wide covered porch, drawing your eye to the panoramic view from the village center, to Klein Bonaire, and the waters of the Caribbean Sea. This upper floor location offers trade winds that will keep you comfortable as you relax, dine and enjoy the beautiful sunsets. Inside you will find a chef's kitchen, free wireless Internet, air conditioned bedrooms, ceiling fans, a flat screen TV, and washing machine. The grounds of Playa Lechi offer gated parking, lush gardens and a large new pool. This popular residence offers great swimming, snorkeling, and diving. Just a few minutes walk to the north you will find a dive shop for your gear, rental tanks, and rewarding shore/boat diving. Just a 10 minute walk south along the seaside promenade to central Kralendijk you'll find wonderful restaurants, waterfront bars and groceries. "I wish I could stay there forever….."
It was our third stay at Playa Lechi, and we are already planning the next year trip. This condo is the best lodging you can get on Bonaire. Walking distance to restaurants, but on the quiet side of the town. Views are breathtaking, I don't think photos do the justice. You can dive and swim just in front of the building. The apartment is very modern and greatly equipped, including washer and dishwasher. Conveniently located dive shop allows for washing and storing your equipment without dragging it every day back to the condo. Have I mentioned that you also get 20% discount on all classes and dives? Last but not least, wifi is fast and allowed me to work couple days remotely, making phone calls, with no problems. The owners are great and respond to any questions very quickly. The place feels really like home.